The Kiwi Buzzsaw Crashes the Best of UK Set! The newest entrant in the Best of the UK game pack differs in one important way from everyone else announced…he isn’t originally from the UK! 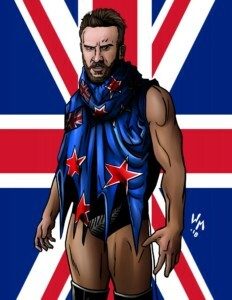 “The Kiwi Buzzsaw” Travis Banks was born in New Zealand and started his wrestling career there before moving to the UK 3 years ago and seeing his career really take off. Banks has won championships in nearly every major UK promotion and is seen as one of the top wrestlers on the UK scene. Now his intense striking wrestling style has caught the eye of a global promotion, so it’s only a matter of time before his star rises even higher. No matter what happens, you can always count on one thing…Banks will kick out at one! Travis Banks joins Zack Sabre Jr., Mark Andrews and Flash Morgan Webster as part of the 8-card Best of UK Wrestling game pack. The set will debut on July 14 at GalactiCon in Pittsburgh, and begin mailing worldwide soon soon thereafter. Get ready to add the best of the UK scene in your indie promotion! Imagine the cool promotional feuds! ← Kingdom Come 2134 Unused Art – Who is This Guy?! ?